I hope everyone had a Happy, Fun, and Safe Halloween yesterday. We were in Galena, Illinois over the weekend and they were having a huge Halloween parade. We didn't stay for the parade, but we saw people arriving at 10:00 a.m. just to set up chairs and claim a spot, and then as the afternoon went on children and adults wearing Halloween costumes started filling the streets. It was very exciting and festive. 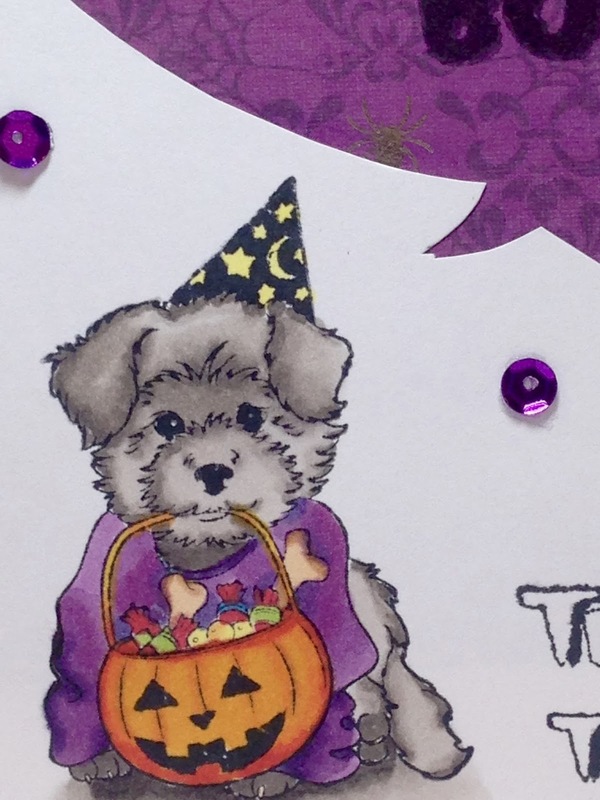 Today I have some Halloween cards to show you. 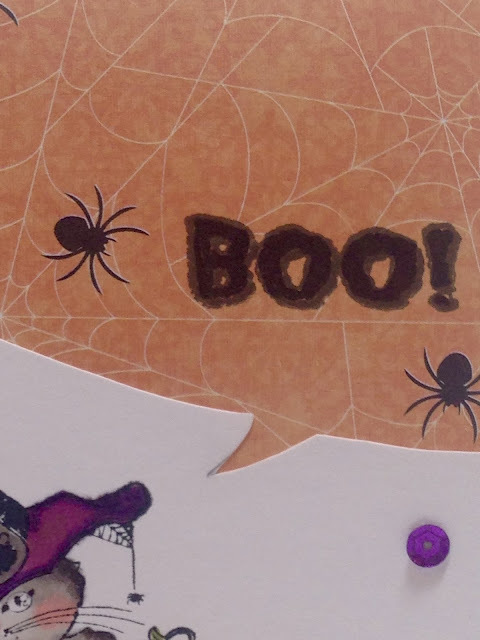 I know most paper-crafters posted their Halloween cards back in August and have already moved onto Christmas Cards, but they do that to sell stamps. I make cards just for fun to give to my loved ones, and I don't want to post them until they receive them, or the surprise is ruined. I sent these cards to my children and nephew. The first two uses images from a Inkadinkao Halloween set. I don't know about you, but I like to keep Halloween "cute" and not "scary", so I absolutely love these sweet images. 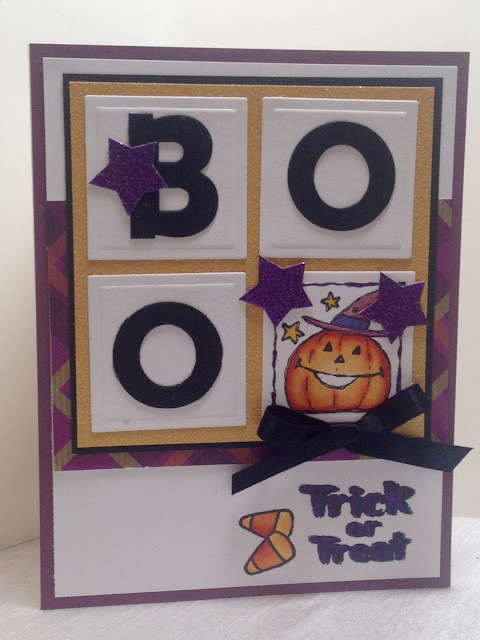 I discovered this fun and easy layout from this card HERE. It was so simple. 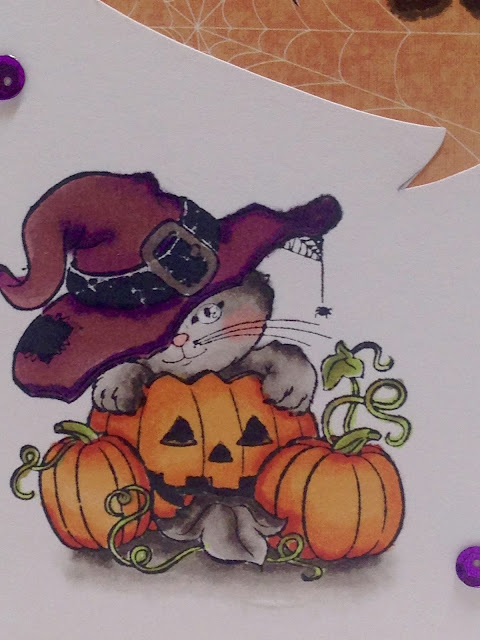 I just stamped the image in the corner of a piece of white card stock and colored it in. Then I hand-drew a cartoon bubble, and cut it out. 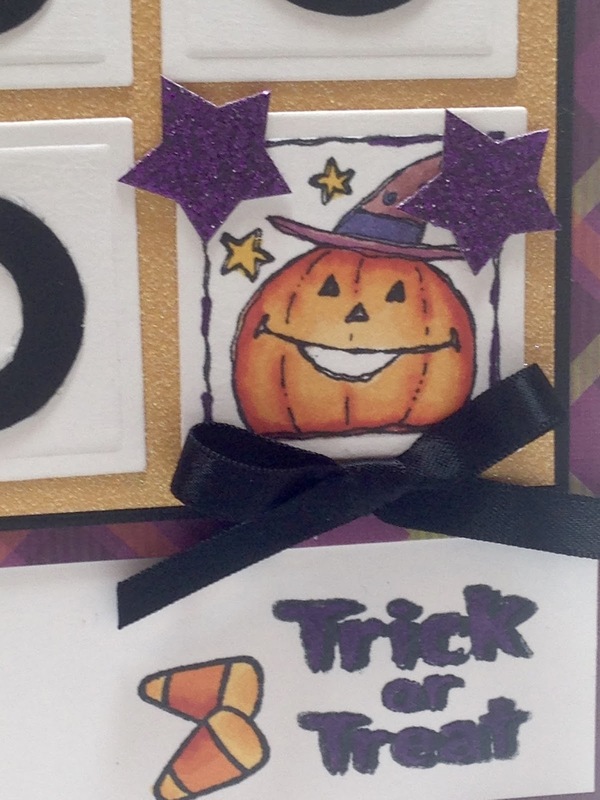 I placed the white card stock over a piece of Halloween Designer Paper from DCWV "The Pumpkin Patch Mat Stack". 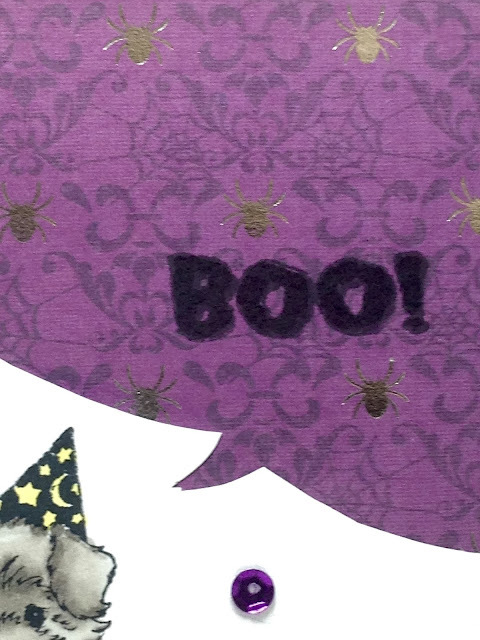 I stamped the sentiment directly onto the designer paper and then colored it in to make it more noticeable. I added purple sequins for embellishment. My next card uses the exact same layout and a different image from the same Inkadinkado set. The papers are also from DCWV. 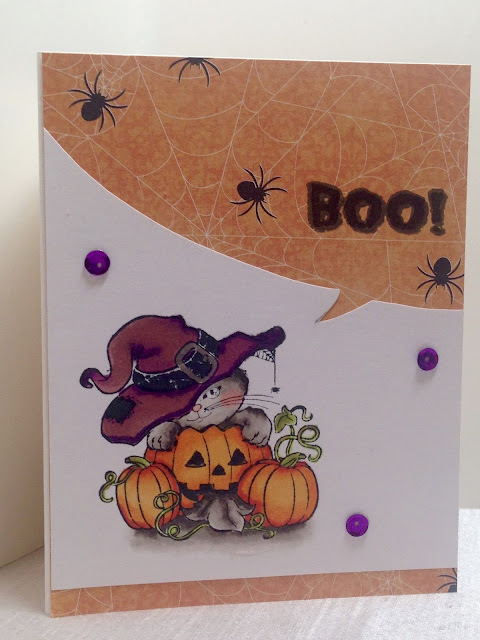 If you'd like to see more Halloween Cards that I made with this set, see this post HERE. And my last card I also cased from this card HERE. I was so excited to see this modern twist on an old stamp set. I don't know about you, but I get so tired of stamp companies coming out with "New Releases" every, single, month. I mean, how many stamps do we really need anyway? I wish they would do a new card using an old stamp set at least once a month. This stamp set is super old, and is retired Stampin' Up! "Festive Four". I followed the original layout almost exactly but I had to make a few changes because my squares were bigger than hers. If I had the chance to make the card all over again, I'd use smaller squares for I loved the embossed star background on hers. I cut all the squares, letters and stars using very old Cuttlebug Dies. 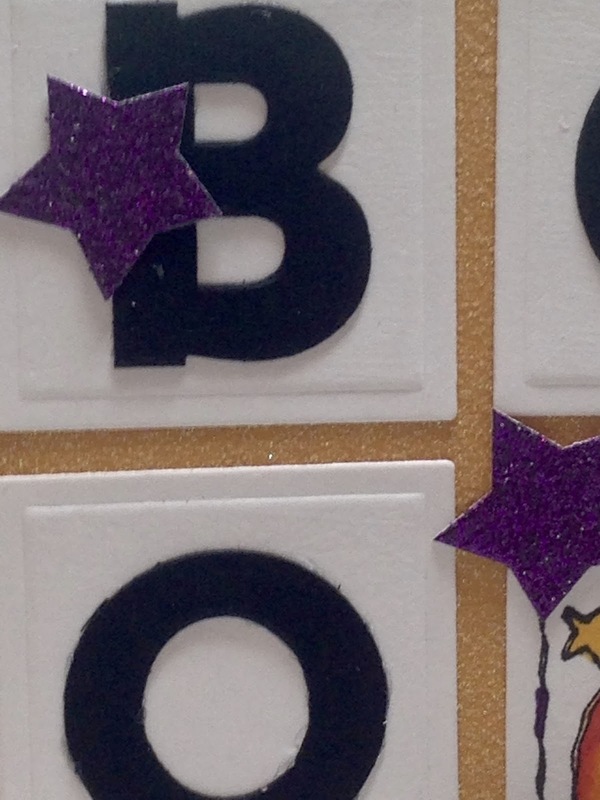 The yellow background and stars are glitter paper. The sentiment is from Inkadinkado. 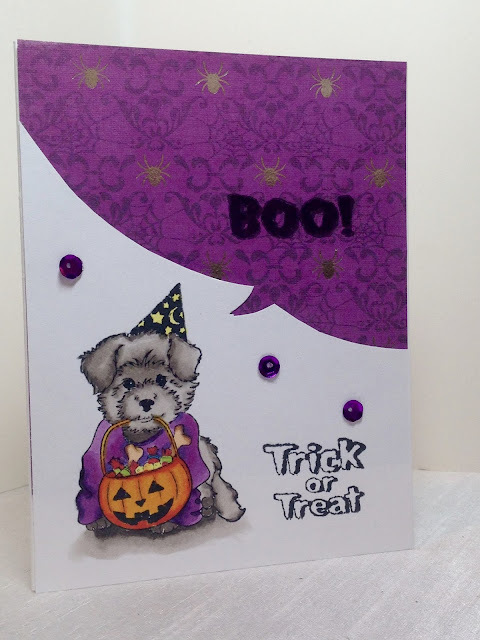 The designer paper is from DCWV "The Pumpkin Patch", and "The Midnight Spell". 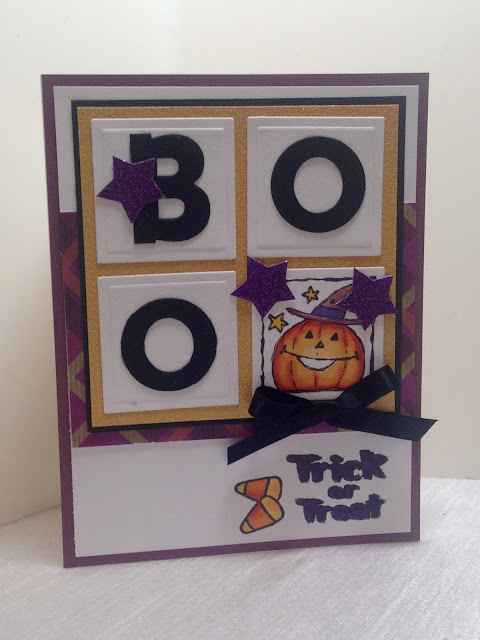 There are three other seasonal stamps in this old Stampin' Up! set. I loved this layout so much, I might see what I can come up using the other stamps in this set. These are all so pretty! 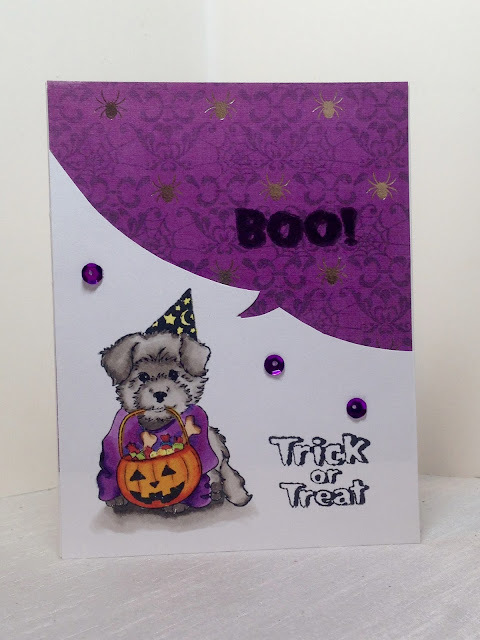 I really love that last card with the 'Boo'! One of my kids teachers loves to make cards, it really is such a great keepsake to give someone. 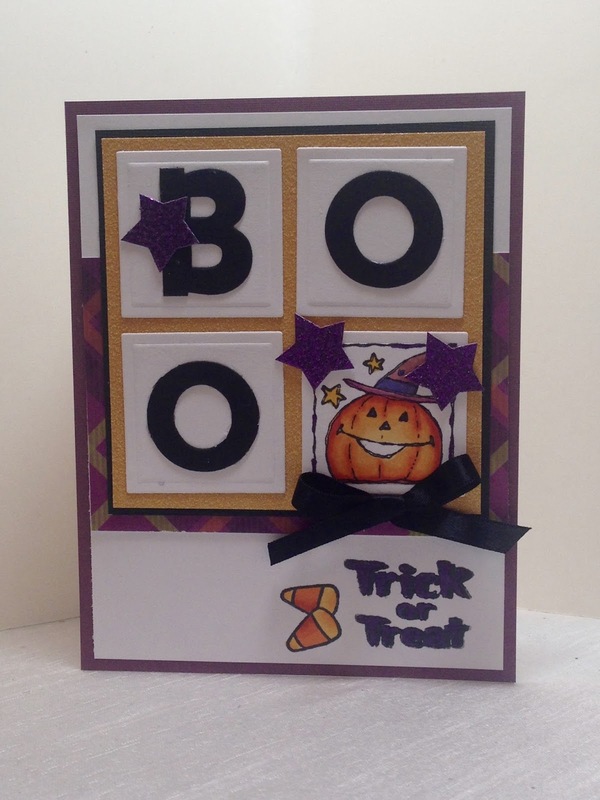 Such fun fun cards!! 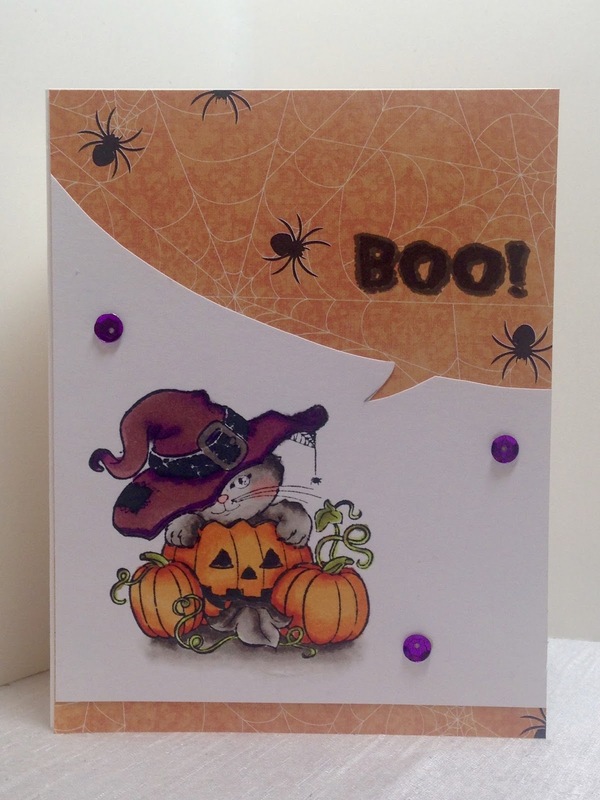 Adorable images and what a great way to use that little stampin up set!